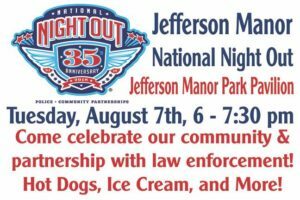 National Night Out at Jefferson Manor Park – Welcome to Jefferson Manor! On behalf of Neighborhood Watch, join your fellow Jefferson Manor residents at the Jefferson Manor Park Pavilion for National Night Out! We will be serving hot dogs (veggie options available), ice cream, root beer, and other cold beverages to all who attend! Owners, renters, and friends welcome. And we are expecting a few special visitors! Millions of neighbors take part in National Night Out across thousands of communities from all fifty states, U.S. territories and military bases worldwide on the first Tuesday in August.